To Sum It Up: Yelena has been sentenced to die for committing murder, but she gets an unexpected reprieve of sorts. She is offered the position of food taster for the Commander of Ixia, a job that is not without risks. Yelena could be fatally poisoned at any time, but it’s either this or face execution. Even after taking her chances by becoming the food taster, Yelena’s tiny hope of leading some semblance of a life is quickly dashed by someone’s determined efforts to kill her by any means necessary. 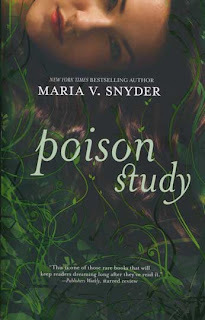 Review: Ah, Poison Study. I first read this about four years ago, after much exhorting from my cousin Ally. As usual, Ally was right: this was amazing! I had borrowed her copy of the book because I wasn’t sure how I would like it; let’s just say that it wasn’t long before I ordered my own copy plus copies of the rest of the books in the series. With a brand new Study book releasing, I figured that a reread of the original trilogy was a good idea, especially since I’d read it pre-blog. Rereads of books that I loved make me a little nervous—will I still love them just as much, or will my opinion have changed? Well, Poison Study has withstood the test of time. I admit that I carried a good deal of sentiment in my heart for it before the reread, so this review is even more subjective than usual. Four years ago, Ally and I talked and talked and talked about this book, plus we persuaded other family members and my best friend to read it, too. So, yes, there are some feelings! Sometimes you start reading a book and it’s instantly addictive; Poison Study is that type of book. We’re immediately introduced to Yelena and her predicament: she’s to be executed for killing a general’s son unless she opts to take the job of food taster to the Commander of Ixia—a position that’s vacant due to the previous food taster’s untimely demise. So Yelena is essentially trading certain death for possible death. Of course her training, under the tutelage of Ixia’s ace spy/assassin Valek, involves learning to recognize different poisons, and I was totally absorbed by the details. Not that I was taking notes for future reference or anything. Yelena’s character evolves so much over the course of the novel, and it’s such a well paced development. In the beginning, she’s both physically and mentally weak from years of torture at the hands of General Brazell and his psychopathic son, Reyad, the man whom Yelena has been sentenced to death for killing. Justice is all-or-nothing in Ixia and does not allow for extenuating circumstances. Slowly, though, Yelena gains strength and confidence, and you’ll find yourself cheering her on when she starts taking self-defense lessons. By the end of the book, she’s a complete badass. Speaking of badasses—Valek. He epitomizes the word with his commanding presence and ridiculously awe-inspiring fighting and spying skills. Seriously—he is NOT a man to be trifled with. But then there’s the side of Valek that carves intricately detailed statues from rocks. What I’m telling you is, I love him love him love him. And oh man, the slow burn between him and Yelena is exquisite. It is absolutely my favorite thing about the book and the entire series. While the world of Poison Study isn’t overly complex compared to other fantasies, it’s very well thought out. The magic element is nicely applied as well, with neither too light nor too heavy a hand. One more bit of last minute gushing: I grinned like a dork when two of my favorite secondary characters, Ari and Janco, made their first appearance. I love the friendship that develops between them and Yelena. To me, the best rereads are the ones where you feel like you’re catching up with old friends you haven’t seen in a while, and that exactly sums up my reread of Poison Study. It sounds fantastic! I love how you felt like you were coming back to old friends and that the side characters had such an effect on you. I'm also a sucker for the slow burn. I've added it to my to-read list. Excellent review :D Jaclyn @ JC's Book Haven. I think you'd love Ari and Janco- they're definitely memorable secondary characters! Yay- I'm happy you added this to your TBR! I've been meaning to read Poison Study for a long time but I've never got to purchase it! I will read it soon because I've heard wonders about this author especially now that Shadow Study is out! I was beyond thrilled that there were going to be new Study books! My copy of Shadow Study arrived today, and I can't wait to start it! I've heard such a good things about this book but still haven't picked it up yet! Your review really makes me think I'll love this though - it seems like a perfect, entertaining fantasy read! I really love the characters in this series, in case it wasn't obvious from all the gushing I do about them, lol. I also think the premise is pretty unique! Gah! WHY have I not read this yet?! I own a copy of the first book after hearing much praise from you and other friends but I still haven't picked it up *groan* I ADORE the sound of of the Yelena and tbh, I have a thing for characters dealing with poisons too - I don't know what it is, I just find it fascinating. I wonder what that says about us LOL Anyways, that plus the delicious slow burn romance ♥ AND awesome secondary characters sound like a winning combination to me :D I can't wait to get started! Fantastic review Lee^^ I'm glad that this one stood the test of time for you! I liked Bridget Zinn's Poison a lot too, hehe. XD I owe all of my love for this book to Ally. If she hadn't found out about it and pushed me to read it, I might never have done so on my own. Game of Thrones Season 5 Trailer!